Nitric oxide (NO) is a gas naturally found in the body that conveys information between cells. In the last decade researchers have found that NO is a signaling molecule of key importance for the cardiovascular system, regulating blood pressure and blood flow to different organs. In addition, discoveries surrounding nitric oxide's role as a principal neurotransmitter moderating erectile function, a pathophysiological negotiator and messenger in inflammation, and a weapon against infections have increased research attention across the fields of biochemistry, chemistry, molecular biology, gene therapy, cell biology, immunology, pharmacology, neuroscience, and physiology. Dr. Louis Ignarro discovered "the atom" of cardiovascular health--a tiny molecule called Nitric Oxide.NO, as it is known by chemists, is a signaling molecule produced by the body, and is a vasodilator that helps control blood flow to every part of the body.Dr. Ignarro's findings led to the development of Viagra.Nitric Oxide has a beneficial effect on the cardiovascular system as well. NO relaxes and enlarges the blood vessels, prevents blood clots that trigger strokes and heart attacks, and regulates blood pressure and the accumulation of plaque in the blood vessels.Dr. Ignarro's current research indicates that Nitric Oxide may help lower cholesterol by facilitating the actions of statin drugs like Lipitor. The goal of the regimen presented in NO More Heart Disease is to age proof the cardiovascular system, keeping the vascular network clean and elastic through enhanced NO productivity.The plan is easy-to-follow without extreme lifestyle adjustments, involving taking supplements to stimulate Nitric Oxide production, incorporating NO friendly food into the diet, and a moderate exercise program. 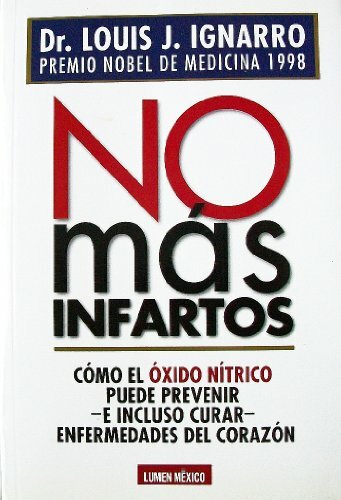 I read this book after trying Nitric Oxide, however, I read an article on the Internet about Dr. Ignarro research for which he won the Nobel Prize in Medicine for his work in Nitric Oxide. I am a Veteran who had lung surgery related to Agent Orange exposure. Heart disease is a part of the disease as is coronary artery disease. I started taking the two supplements L-Argine and L-Carnitine in September of 2008, as I had blockage in my lower extremities and was in danger of losing my big toe to diabetes. About six months after taking the supplements I was tested there was no blockage. I recently had a physical and my blood pressure went down 30 points and for a 62 year old man my current blood pressure is 118/78. There was a new test that was administered from a blood sample on my heart. For my age the reading should be in excess of 600 for a man my age, the reading was less than 10. There is no heart problems today as there was just two years ago. 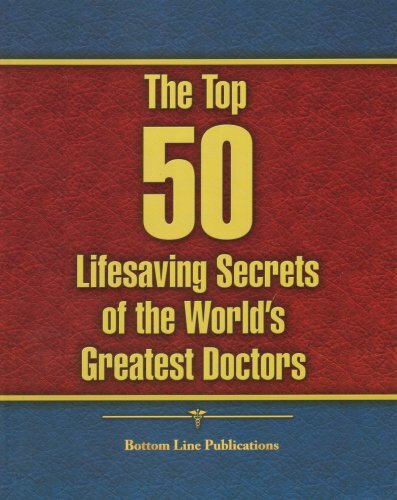 I found the book informative and I thank Dr. thank Dr. Ignarrio for writing about his research. I credit him with saving my feet by allowing more blood flow through my femoral arteries, and my life. I researched an alternative to the use of a statin for cholesterol lowering after suffering an eye stroke. 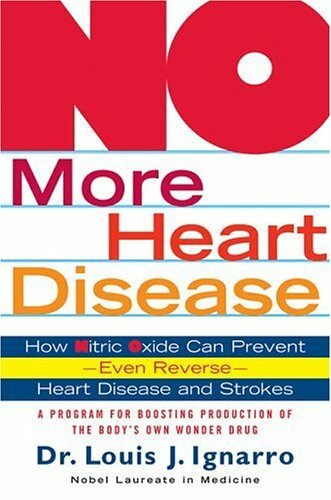 This book, along with two others, was recommended to me for the use of NO (nitric oxide) as a "cocktail." I read it, highlighted and tabbed and went for it! It has been two weeks but feel stronger (p.s. I eliminated all Rx except for a coated aspirin, with MD's o.k. ), more motivated and look forward to other gains. I will be 80 in January and felt quality of life more important than a drug-induced, possible aching bones, approach. Be assured, the o.k. of your physician is very important but I believe mine has enough faith in me to say o.k., just watch your blood pressure as this could lower it. The author provides a complete and thorough guide on the benefits of Nitric Oxide. At the end of each chapter, the author reviews what was discussed in the chapter to ensure you understand what you have read.Dr. Ignarro discovery of Nitric Oxide is a definitely a breakthrough worth reading. Additionally, sprinkled throughout the book are patients and clients feedback on how Nitric Oxide has impacted their lives. 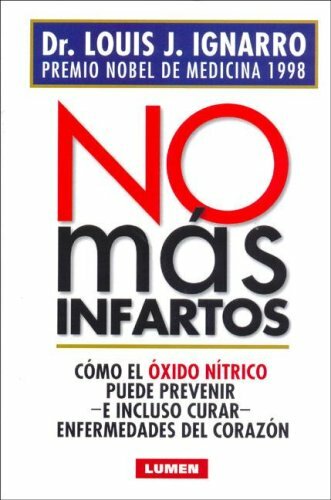 The Nitric Oxide program can include a powder formula which is mentioned on p. 123 or supplements which are mentioned throughout the book.Chapter 7 offers a food list as an alternative/complementto obtaining Nitric Oxide in the body. Each volume of Advances in Pharmacology provides a rich collection of reviews on timely topics. Emphasis is placed on the molecular bases of drug action, both applied and experimental. 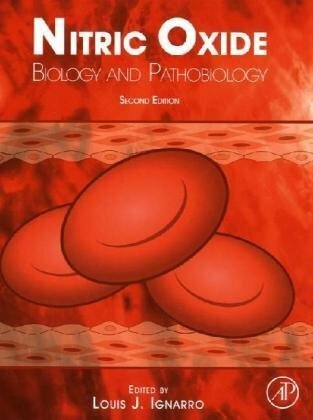 This volume contains chapters that address diverse but interrelated areas pertaining to the chemistry, biochemistry, molecular biology, and pharmacology of nitric oxide in mammalian cells. 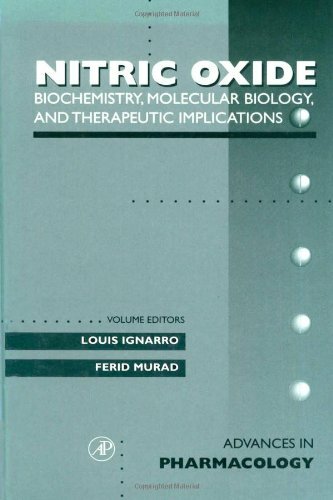 The contents form a comprehensive treatise of factors influencing the control of nitric oxide production in various cell types.